This second winter Great Black-backed Gull, photographed at Newlyn Harbour, already has that ever watchful menacing look about it. Even at this young age this bird has the air of invincibility that makes it a great photographic subject. In and around ports they are less wary of people and can therefore be approached to within range of a hand held 400mm lens, filling the frame. Insight into Great Black-backed Gull (Larus marinus): the largest gull in the world found mainly on the coasts around the UK but increasingly inland. It is mainly a scavenger, taking food from other birds, feeding on discarded fish and visiting inland waste tips. 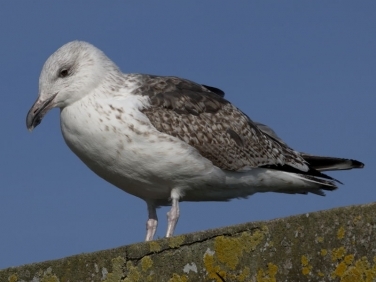 It will also take live prey and will raid seabird colonies for chicks.